In the time when almost all organizations around the world have succumbed to recession, the Eurasian Bank, a bank in oil-rich nation, Kazakhstan, has unveiled a new VISA card designed for a private club of VIP clients. The one of a kind luxury VISA card is adorned with a shimmering 0.02 carat diamond and a slight Midas touch to entice the club members. This recession-defying offering from the Kazakh bank will be issued to clients with an annual income of $300,000 or above. Dmitry Nikolin, the executive director of Eurasian Bank, says that the diamond-encrusted credit card will be offered to clients beyond Kazakhstan as well. While some people might consider luxury watches an extravagance, many luxury designer watches are a great way to show off their riches. Renowned Swiss watchmaker Hublot has already impressed the gentlemen with their $1 million exclusive Big Bang watch and the Valentine Big Bang Red Gold Diamond Ladies Watch. Now, they have launched a limited edition of Red Devil Bang watches to celebrate their official timekeeper partnership with Manchester United football club. The watch will the feature moniker of “Red Devil” and will reveal a distinguishing range of multihued design details. 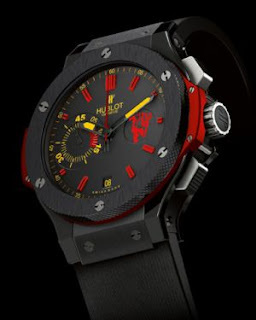 The Hublot Red Devil Bang timepiece is crafted from satin-polished black ceramic and has a strap in ribbed black rubber. The Manchester United logo sits at 3 o’clock. The special 45-minute chronograph counter is designed to measure the halves of a football match. Carrying forth the legacy of Big Bang watches, the Red Devil Bang is adorned with glare-proofed sapphire crystals. The sporty watch is water resistant, up to 100 meters. Only 500 units, which are individually numbered, will go on sale, and a part of the proceeds will go to the Manchester United Foundation.